Tweetfave is a free service to help you get more out of Twitter favorites. 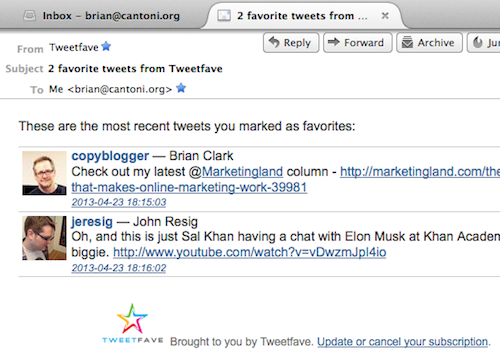 Tweetfave monitors your Twitter feed and sends the tweets you mark as favorite to your inbox. I built Tweetfave for myself (“scratching my own itch”) and it’s really helped me track and remember interesting tweets and links. It’s especially useful when reading my Twitter feed on a mobile phone. If I don’t have the time (or patience) to read linked articles on the phone, I’ll mark the tweet as a favorite, knowing it will arrive later in my inbox.